Use some of that Criollo food to power a kayak and paddle to those remote snorkeling sites! The dive shops, some gift shops, Mini Mas and some water taxis will rent you the necessary mask and fins. Please wear a t-shirt to protect yourself from the sun (unlike in the picture)! In Culebra you can access a lot of very good snorkeling reefs from the beach. That means you get there either by car or on foot. 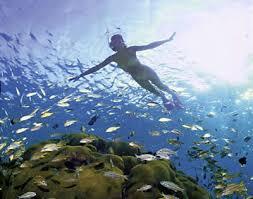 Good snorkeling is found on Melones and Carlos Rosario, perfect Culebra beaches. The other option is access via boat. When kayaking, ask about the currents, that can make the return after an exhausting day - even more so!